He may have been missing from Marvel's Avengers: Infinity War, but the crack-shot bowman Hawkeye is about to get very busy. A new report states that not only is the character returning for the Avengers: Endgame blockbuster finale, but also a new exclusive show headed to the forthcoming Disney+ streaming service. 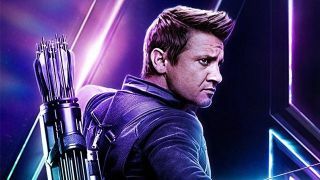 According to Variety, actor Jeremy Renner will be reprising his role for an adventure series, with Hawkeye's everyday-alter-ego Clint Barton working alongside the Marvel character Kate Bishop. For those familiar with the comics, it's Bishop who eventually picks up the Hawkeye mantle, so that gives some indication as to where the show could be going. If the rumor is true, the Hawkeye show will be joining an increasingly long list of Hollywood spin-off exclusives for Disney, including more Marvel shows featuring Falcon, Winter Soldier, Vision, Scarlet Witch and Tom Hiddleston's villainous Loki. That's before considering a number of Star Wars shows in the works – one centered around a bounty hunter played by Pedro Pascal of Narcos and Games of Thrones fame, and the other starring Diego Luna who will be reprising his Rogue One role of spy Cassian Andor. Disney+, set to land before the end of 2019, certainly has its share of crowd-pleasing exclusives lined up, and will no doubt have a full compliment of Disney animated flicks and classic films alongside the above. But it too faces stiff competition from the likes of Amazon Prime Video and Netflix (whose original programming continues to go from strength to strength) and the newly announced Apple TV Plus, which has secured a giant roster of AAA talent for exclusive productions, including Steven Spielberg and Oprah Winfrey.